CINCINNATI -- Many dorm-residing college students dream of the day they can have their own bathroom or kitchen, but a new housing option in Walnut Hills is touting shared rooms as its key selling point. It’s called a co-living space – and the founders of a Cincinnati real estate firm say they will introduce Ohio’s first on April 1 . Klinge Flats at 2411 Gilbert Ave. boasts six private bedrooms, but tenants must share the two kitchens and three bathrooms with that guy or gal down the hall once the space opens mid-April. The first floor is devoted to co-working space and a communal living room. Kunsthous , an organization founded by the combination of two real estate companies last August, is behind the idea. Although millennials are more digitally connected than ever, they tend to have fewer close friends in whom they can confide, according to Forbes . 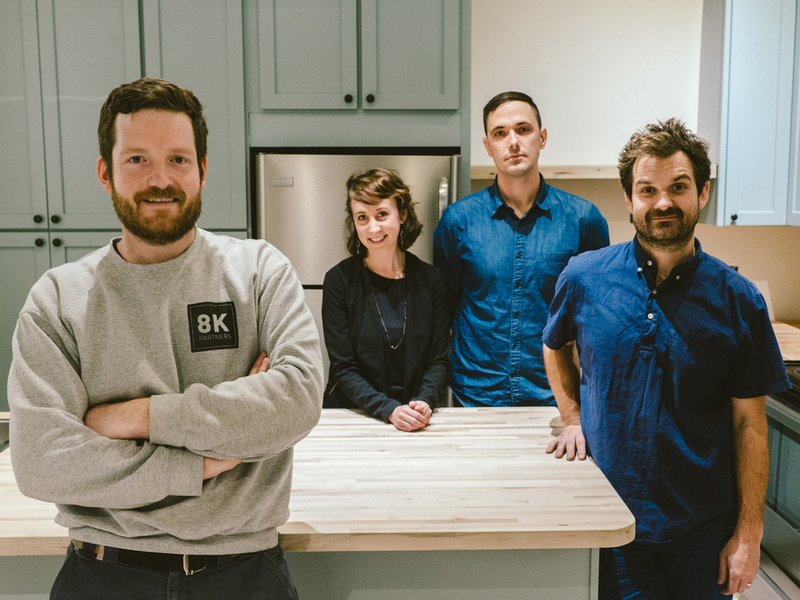 Kunsthous co-founders (from left) Barrett McClish, Alyssa McClanahan, John Blatchford and Michael Fischer. When Blatchford moved from upstate New York to a McMillan Street apartment in 2010, he overcame this “lonely Millennial syndrome” thanks to friendly connections that changed his life. Now, he wants to give that experience to others. "I became friends with people on the third floor within the first two weeks and through those two people, basically everything good in my life has come as a result,” Blatchford said. "The more people that you meet and have a connection with, I think the happier and better we’ll all be." Co-living, also known as co-housing, has grown in popularity over the past few years along America’s coasts as a solution to skyrocketing rents and stagnating wages. Kunsthous’ particular version of co-living caters to single people under 35 or couples without kids. 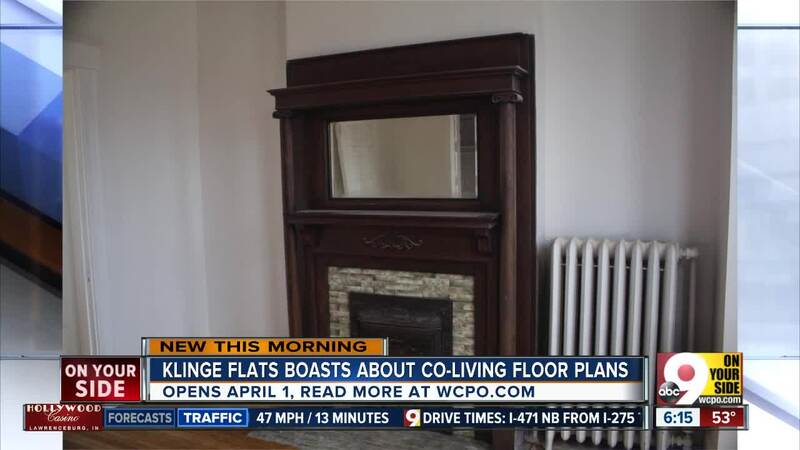 They could be recent transplants to Cincinnati who aren’t well-established and need a way to meet others, but Blatchford said empty-nesters could also benefit from communal living. Klinge Flats will offer residents at least one community brunch per month, but Blatchford hopes the tenants will start planning their own events over time. As an example, Blatchford cited a cocktail party and show-and-tell on March 15. 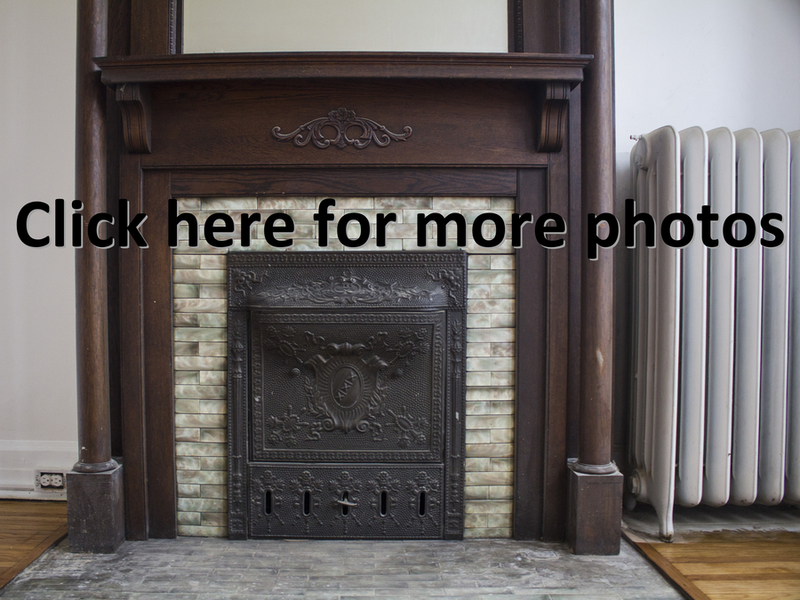 Kunsthous' tenants in more traditional apartments in Over-the-Rhine and Northside organized the event. Affordability is also a major priority when considering co-living, Kunsthous co-founder Alyssa McClanahan said. Average rent in Greater Cincinnati currently stands at $862 . However, a Klinge Flat bedroom will cost $650 per month and include utilities and access to hundreds of square feet of shared space. 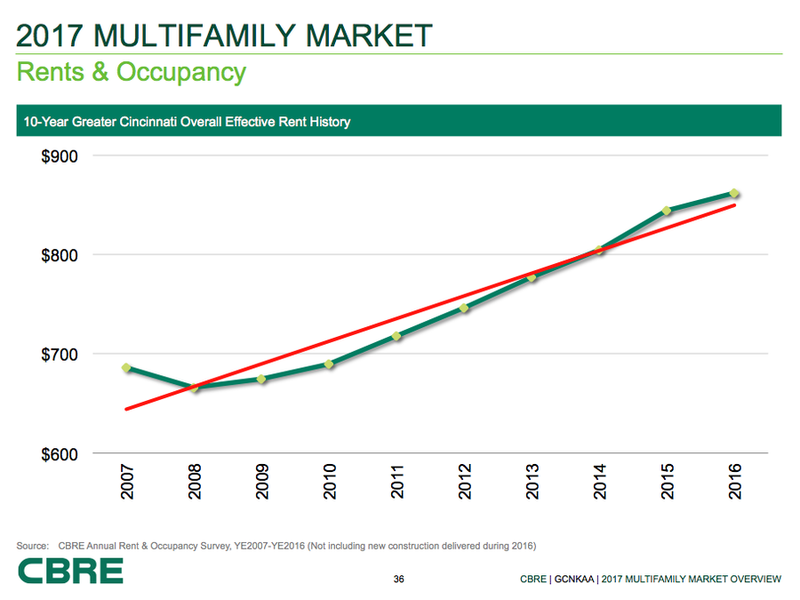 Average effective rent prices for Greater Cincinnati have climbed nearly $200 over the past 10 years. That price point could seem especially desirable as rent in the Queen City continues to climb. Bloomberg listed Cincinnati as having the fourth largest projected rent increase (by percentage) for American metro areas in 2017, ranking behind only Seattle, Portland and Denver. Blatchford and McClanahan, a boyfriend-girlfriend team, said they plan to move into Best and Lothes , another six-unit co-living space their organization is opening in the fall with the help of OTR Adopt . The property will be at 205 W. McMicken St.
Best and Lothes will offer six studio apartments at two price points: about 300 square feet for $500 to $600 per month and about 500 square feet at $800 to $900 per month. Kunsthous also plans to have a “family-style” building ready by late spring 2018 at 509 E. 12th St. in Pendleton with slightly larger apartments and access to 700 square feet of shared space. And there are even more co-living properties in the pipeline, Blatchford said. The Golden Girls made co-living look easy, but not everyone is so lucky to have their roommate squabbles neatly smoothed out by Hollywood writers in 25-minute chunks. Sharing space with others can always lead to conflict over whose turn it is to scrub the toilet or whether or not someone swiped a leftover Turtle from Gomez Salsa out of the fridge. Kunsthous is trying to mitigate any drama beforehand, but Blatchford said the company is going to figure a lot of that stuff out as it experiments with the opening of Klinge Flats. Kunsthous will hire people to clean the common areas and will provide tenants with separate areas for food. Blatchford said the spaces will also have quiet hours and security above and beyond a regular apartment because there is so much shared space. Blatchford said he also hopes connecting with neighbors through Kunsthous’ shared spaces will create a built-in accountability and mutual respect. The theory is it's harder to steal your neighbor’s beer from a common fridge if you’re also friends (or at least you’ll replace it once you’ve drunk it). “Kunst” means art in German, and artfully restoring the architecture and preserving the history of these buildings is important to Blatchford, McClanahan and the two other Kunsthous co-founders, Barrett McClish and Michael Fischer of 8K Partners . Originally from Loveland, McClanahan has a PhD in history from UC and uses that expertise to dig up long-lost records on the people who lived and worked in the buildings Kunsthous acquires. She said genealogy websites and local newspapers help her "do justice” to former owners’ and tenants’ lives as she blogs about them and prepares a book to distribute to Kunsthous residents. Although new construction is also welcome, it’s always important to preserve the social fabric and historical integrity of the community, said Thea Munchel, director of development at the Walnut Hills Redevelopment Foundation . Klinge Flats takes its name from the family-owned Klinge Lock and Safe next door. The Klinges lived at 2411 Gilbert Ave. for many years. Klinge Flats takes its name from its longstanding residents, the Klinge family, which still operates Wm. 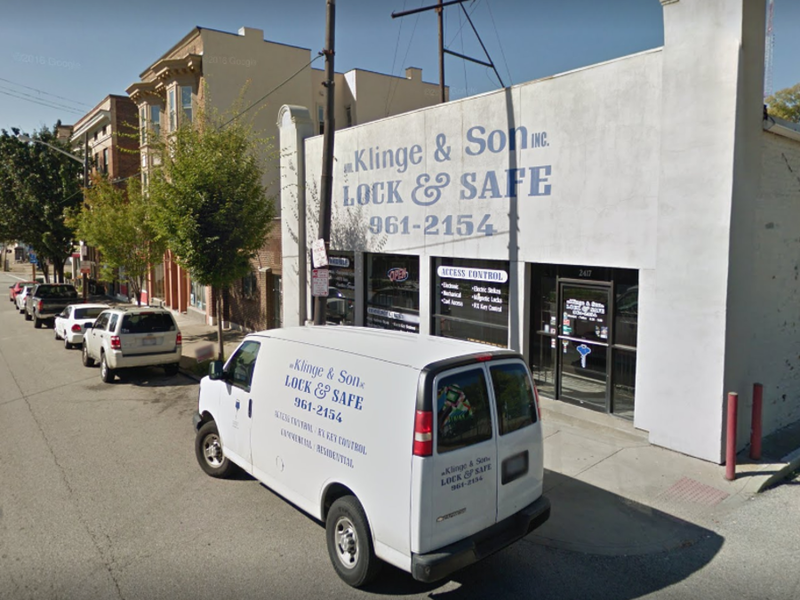 Klinge and Son Lock & Safe next door at 2417 Gilbert Ave.